What on earth is going on with casino gaming in Connecticut and Massachusetts? Trouble is brewing in the casino world on the border of Connecticut and Massachusetts. No, this doesn’t really affect casino gamblers negatively. But it’s nonetheless crazy to watch from the sidelines as MGM pulls out all the stops to try and bring a Connecticut casino to a halt. Why? Because they’re building one just six miles away in Connecticut. Here’s the quick backstory. 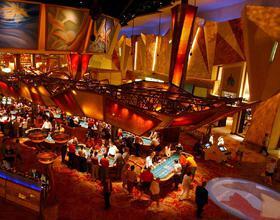 MGM has committed to spending $1 billion on a Springfield casino. Their proposal was approved by the state of Massachusetts fairly recently, primarily because the state was wowed by their amazingly impressive complex that even featured a 25-story hotel tower. This past September, MGM decided to no longer build the tower. And in their casino scope reduction plan, they also decreased the size by a bit by 14 percent. Still, the casino is going to be built and MGM is counting on a good chunk of its players crossing state lines from Hartford, Connecticut. In fact, MGM predicts that about 33 percent of its customer base would be made up of gamblers from the affluent Hartford, Connecticut suburbs. After all, there’s no casino serving that market right now. But that’s about to change. Big time. The state of Connecticut has approved a new joint venture between the Mashantucket Pequot and Mohegan tribes to develop a brand new property in East Hartford. To say MGM is angry would by the development be an understatement. They assumed they had cornered the market and didn’t anticipate anyone standing in their way. But what they clearly forgot was that State governments don’t always talk to each other. And usually, Governors have their own constituents and coffers in mind, not those of a neighboring state. The two tribes have exclusive rights to build a casino in Connecticut, so it sounds like MGM is angry that it is completely shut out of any chance to grab a piece of the revenue machine that would be a new casino. MGM has enlisted the help of a lobbying firm in an effort to kill the casino bill that would ultimately allow the new casino proposed by the two tribes. Considering Connecticut has brought in more than $6.5 billion in revenue for the state’s coffers since the 1990s, it’s highly unlikely that MGM will succeed in their lobbying efforts. After all, what state representative or senator in his or her right mind would vote against a bill because it angers a big corporation in a neighboring state, whose casino won’t actually bring in any money for the state voting against the bill? Of course, we’re talking about US politics. Stranger things have happened and continue to happen on a daily basis. We’ll be keeping our eye on this one, but whatever happens at least you can take comfort knowing that there’s a casino within your reach whether you live in Connecticut or Massachusetts right now. We’re talking, of course, about online casinos. Fire up Palace of Chance and enjoy the best games right now. We have all the best slots and table games waiting for you. And best of all, instead of trying to shut down our competition, we’re focused on making our players happy so they choose us.